The Aérospatiale Gazelle is a French designed, single engine, reconnaissance and observation helicopter used widely by the French and British Army. 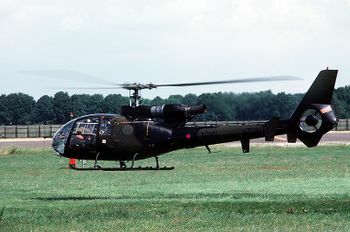 Originally developed by Sud Aviation, it was produced mostly under the Aérospatiale brand, a subsequent division of EADS. It was the first Helicopter to have a Fenestron, a protected tail rotor that reduces noise. This page lists all films that feature a variation of the Aérospatiale SA 341 Gazelle. Pages in category "Aérospatiale SA 341 Gazelle"
This page was last modified on 27 May 2014, at 05:22.